On the band's second album� members of the local four-piece embrace the music they grew up with instead of being embarrassed by it, and embark on an intrepid quest to find the lost feelings that made Weezer's "Blue Album" possible, before Rivers Cuomo's disillusionment. The result is a whole-heartedly good-natured romp, unadulterated alternative hermetically sealed from the musical tides in which Doctor Squid swims. 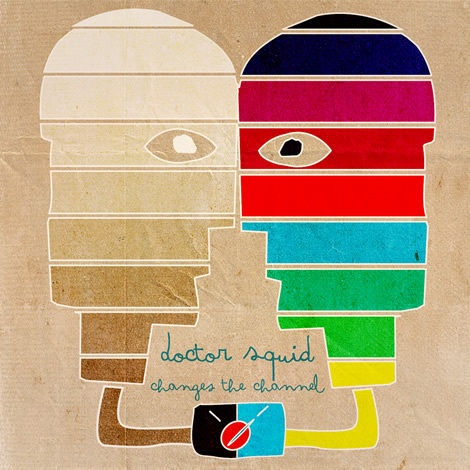 Doctor Squid's sound � '50s back-beats, syncopating handclaps, falsetto sweetheart melodies and doo-wop ooo's and ahh's � is at once an intimation of the original pop music sound over 50 years old and an imitation of the reverential revival of the same sound from the '90s� It is an appreciated approach to the power-pop formula, one that might make you long for something you didn't realize you missed. Besides, it takes a real cynic to hate on something so hell-bent on having fun. This album is certainly quite a bit calmer, softer, and more subdued than their first one, but in many ways, it is also much more solid and well-put together. Without a doubt, this record displays their incredible growth as a band. And even when the subject matter is sadder or darker than one might expect, there's something about hearing this band's music that never fails to make the listener feel great. Athens, Georgia band Doctor Squid returns with a more measured tone compared to its debut album... The band has definitely matured here, with more deliberate melodies and well crafted harmonies (like on "As Soon As I Discern" and "Rock Solid"). The apparent solemn ballad "Come Around" is almost a intermission for the listener between all the heavier, faster tunes... It's just great to find a young band carrying the torch of melodic rock and roll. Very catchy alternative pop as evidenced by the bouncy "On My Way." The loud "Whoa" chorus gets stuck in your head pretty quickly. "Take A Look" makes good use of those background "oohs" and hand claps with a driving bass line. The buzzing guitar and gentle harmonies of "Things We've Chased" and "Victoria" is juxtaposed by verse that describe a set of interesting situations about women. The funkier songs here have a studied sloppiness to them that is both compelling and laid back ("Down By The River" and "Atomic Reaction"). One of the best songs "3am Electric" has a persistent rhythm and great lyrics. Their upbeat music always fills me with joy, and their songs are ridiculously infectious... Trust me, seeing one of their shows is such a joyful experience that you just can't stop the excitement! The group of dedicated fans they have that know all of the words to their songs can attest to this. 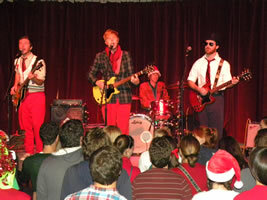 As one of my five current Athens favorites, Doctor Squid is certainly the band to see if fun is what you desire. Band member Mark Spurlock describes Doctor Squid's music as "ridiculously catchy pop/rock" from Athens, Georgia. He adds that some fans have compared Squid music to "early Weezer." Don't know about that, but he hit the first part right on the proverbial head...The young and very-young-at-heart should get a kick out of this.